Nathalie Trantic took home the MBC Youth Award at Dubai Lynx. Trantic (C) with fellow students and Joumana Ibrahim to her right. 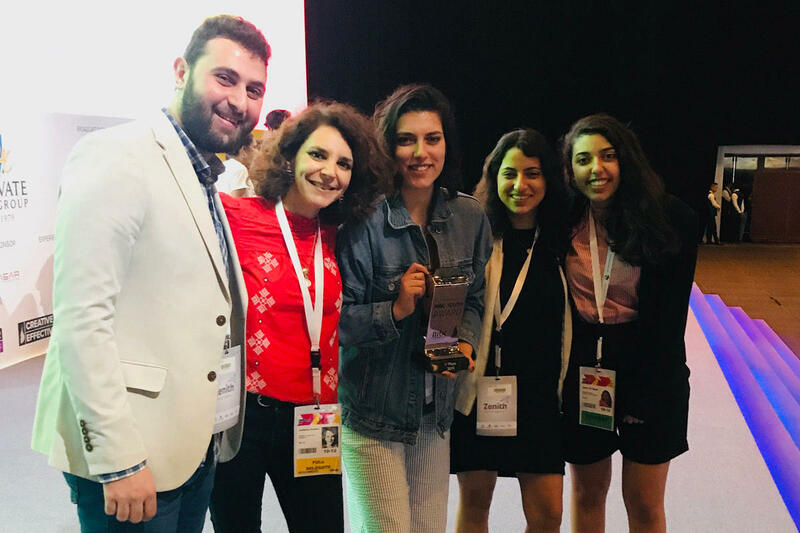 Every year, thousands of students and young professionals from across the Middle East gather in Dubai for the Lynx competition, which celebrates the region’s creatives by giving awards to emerging talents from different backgrounds, including design, advertising, marketing and more. This year – as in previous years – LAU had a lot to celebrate. Two students from the School of Architecture and Design (SArD) were shortlisted in the Student Integrated Competition, one in the Student Print Competition, and one in the MBC Youth Award Competition. But the biggest win of the day was Nathalie Trantic taking home the MBC Youth Award, landing her a one-month internship at the region’s leading media company. For her winning project, Trantic, who graduated in fall 2018 with a bachelor’s in interior architecture and a minor in advertising, developed a new brand identity for the MBC e-sports team, as well as an integrated campaign for an e-Sports championship. In preparation, Trantic conducted extensive research on the e-gaming community and developed a strong concept for her project. The result was a campaign that expertly weaves traditional media such as print ads and posters with a strong digital input through customized phone applications and social media channels. Trantic was in fact well prepared for this through her educational curriculum. That is because, in design studios, students work on projects in much the same way contestants do at major international competitions, by investing time in research, brainstorming ideas, developing plans and submitting multiple iterations to panel reviews. “The class that helped me enter and win this competition is Advertising Design, since we worked on projects from start to finish following the same routine,” she said. This interest in advertising led her to choose it as a minor, which supports the school’s drive toward interdisciplinary studies. Joumana Ibrahim, adjunct faculty in the Department of Art and Design, agrees. “Participating in awards at both the regional and international levels is very beneficial and constructive for students, professionals and educators,” she said. Ibrahim was Trantic’s instructor in Advertising Design and herself has a background in the ad industry. She helped prepare her students and flew with them to Dubai for the festival. “Before I started teaching design, I worked in advertising with Leo Burnett. My experience taught me a lot about how to approach award shows and the level of work expected to enter such competitive environments,” she said.